Do Blood Red Moon speak to us today? This year began a Blood Red Moon Tetrarch, which is 4 consecutive blood red moons that occur on Jewish feast days (really the Lord’s feast days). Jewish Rabbis teach that blood-red moons signify trouble for Israel. The Jewish Talmud (book of tradition) records: “When the moon is in eclipse, it is a bad omen for Israel… If its face is as red as blood, it is a sign that the sword is coming to the world…” Since the time of Jesus’ first coming there have been exactly seven back to back occurrences of blood-red moons which occurred on the Jewish feast of Passover first and then on the Feast of Tabernacles (Sukkot). We know from history that each of these occurrences signaled momentous events happening for Israel and the world. For example: One occurrence was in 1492 which marked the end of the Spanish Inquisition in which thousands of Jews were killed or forced to convert to Christianity. Interestingly, it also marked the time when Columbus set sail from Spain to discover the new world! ; and again the 1948 heavenly event marked the re-establishing of the state of Israel midst war and bloodshed; and again in 1967 blood-red moons marked the taking back of Jerusalem by Israel for the first time in 2000 years. In the midst of this blood red moon cycle there are two eclipses of the sun, one on March 20, 2015 and the other on September 13, 2015. So what you say? These two dates on the Biblical calendar (the calendar God uses) are Nisan 1 and Tishri 1. 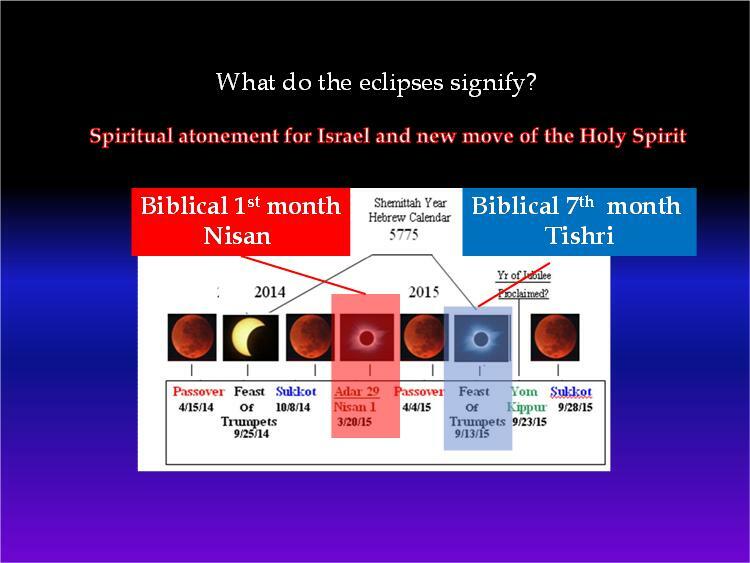 Nisan is the Biblical New Years Day, the start of the month of the Exodus (the supernatural creation of Israel), all the festivals (mo’edim) count from this month and there will be an eclipse on this day! While blood red moons, which are eclipses of the moon, signal hard times for Israel, eclipses of the sun represent hard times for the world! Tishri is the 7th Biblical month and Biblically it is known as the Feast of Trumpets, which is often associated with the coming of Messiah. 10 days after the Feast of Trumpets on September 13 will follow the next feast, The Day of Atonement or Yom Kippur. Next year, in 2015, this date will be September 23 and will also be a very special time on God’s calendar that occurs only once every 50 years, the Year of Jubilee. And on that day there will be another eclipse of the sun. The Year of Jubilee was originally to have been a day of great blessing in which debts were forgiven, ancestral property that was lost was restored, and slaves were set free. But, the Jews never kept it so it became a curse for them instead. The clear lesson is if we obey God we are blessed but, if we forsake Him what should have been blessing turns instead to a curse. What about America? We have clearly been blessed by God but have we forsaken Him and His laws? According to Rabbi Jonathan Cahn, author of The Harbinger, we have, and the judgments have already begun. He revealed how the last two financial collapses were direct results and occurred on Biblical dates. He predicts the 3rd collapse will come in 2015. “You will want to remember this date May 14, 2015. This date is right at the beginning of the blood red moon cycle of 2015; shortly after the 1st eclipse and right after the 1st blood red moon of Passover. While the government has its preparation plans, we need to have our own! And the most important plan is to be on speaking terms with God. A lot of people go the wrong way in how they prepare, too. I like what Johnathan Cahn said and what you did at the end of the post; draw near to Jesus. He knows the future and in Him we can be ready for anything; our own worldly wisdom always fails. Great article!